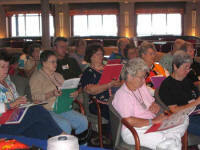 Sandee Cherry -- 37 years as a Machine Knitting Author and Instructor. My personal teaching goal is... after you have attended a Seminar or Workshop you will walk away so inspired you can't wait to go home and start knitting! 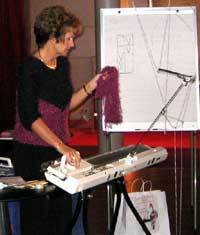 Below is a list to help everyone find Knitting Machine Seminars & Workshops Worldwide. If you would like information e-mail or call the contact person below. Check this page often, we add locations as they are confirmed. Click here to read more and request Sandee's classes and information if your group would like to sponsor a Seminar or Workshop. If you would like your Seminar/Workshop listed below free of charge (this list does not include Monthly Knit Clubs) please email us or use our Contact Form. Dates to be added when confirmed. • Looking forward to teaching for many of you at a Seminar or Workshop in the near future! • Seminar and workshop days are fun but long... following are some tips to help you through the day. • Use address labels to mark purchases in case they are lost. • Use address labels if something needs to be shipped. • Wear comfortable clothes and shoes. • Bring a light bag to carry purchases. • Bring a few snacks, apple, trail mix, nuts or something that will boost energy. • Check the website of each of the instructors. Print their order form, then take inventory of the books that you own so you don't double purchase.